Earlier this week Shaan Hurley announced on Twitter that he had a new toy. Design and Motion are pretty chuffed that it happens to be a Lenovo Yoga running Windows 8. John blogged about Lenovo’s new convertible touch screen devices a few weeks ago. Anyhow, since I’ve been using Windows 8 Pro at home since late January, I figured it was time I wrote about my experiences and provide some of our CAD readers some tips on getting up to speed. Here’s my first opinion, Windows 8 is more efficient to use than any other Windows OS before it. My advice is; don’t go regressing back to old habits and making the OS look like Windows 7 or worse Windows 98. I know of people who still want their Windows OS to look like Windows 95… time to move on I say. Most importantly they see the value of the OS and want whoever starts to use it for the first time to succeed. How do I get back to my desktop, once I’ve opened a Metro App? How do I put this bloody thing to sleep? How do I close a Metro App? To answer my first question. 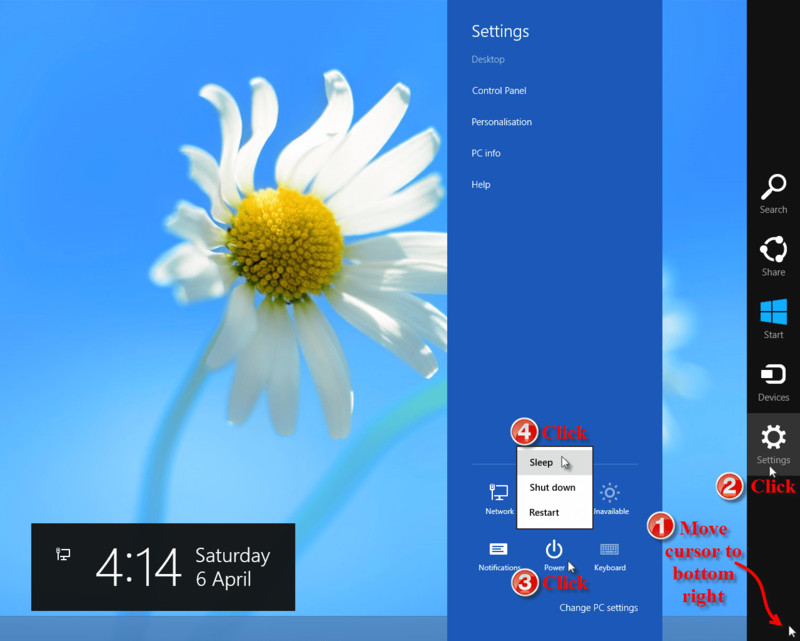 Pressing the Windows Key toggles the Metro style Start Menu on & off, just like the old start menu did. That’s all fine and dandy until you launch any of the Metro Apps, at which point pressing the Windows Key toggles you back & forth between the most recent Metro App and the Metro Start Menu, VERY FRUSTRATING. Robin Capper’s suggestion above is a good visual cue & a ‘metro’ solution for the Show Desktop button we’re all used to from XP, Vista & Windows 7. A lot of you may prefer Robin’s method, however, I prefer to user Ctrl + D instead. Mainly because I quite like having the Mail app on the top left, at the end of the day it will depend on which Metro app you use the most. The answer to my 2nd issue came from Twitter as well, I just can’t remember who told me now to give them credit. So thank you to whoever it was. Although this is the same number of clicks as in Vista & Windows 7, its does seems a little more convoluted. The mouse movement distance is almost the same as well, but you do have to wait a second or so for the black (its initially transparent) fly out to appear. The video shows you have to move around within and between Apps & Applications in both environments. Some people like to suggest Windows 8 is essentially two separate operating systems, although that may be true I prefer to think of the Metro interface as the old Start Menu on steriods. 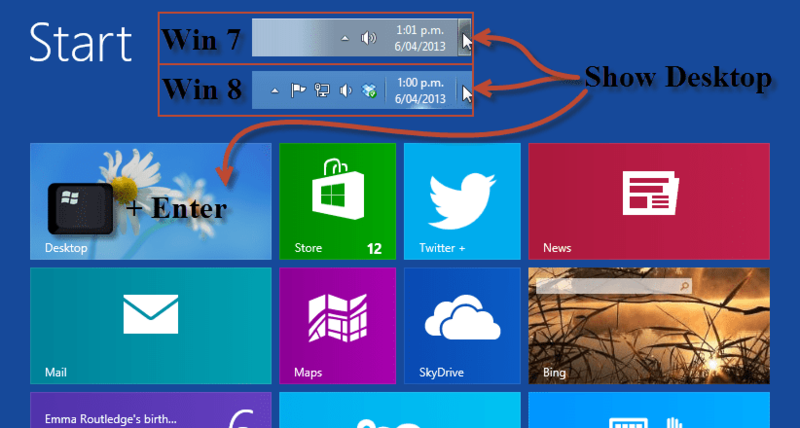 I’ve found that by thinking of it this way and using the techniques highlighted here your transition to Windows 8 becomes straight forward. 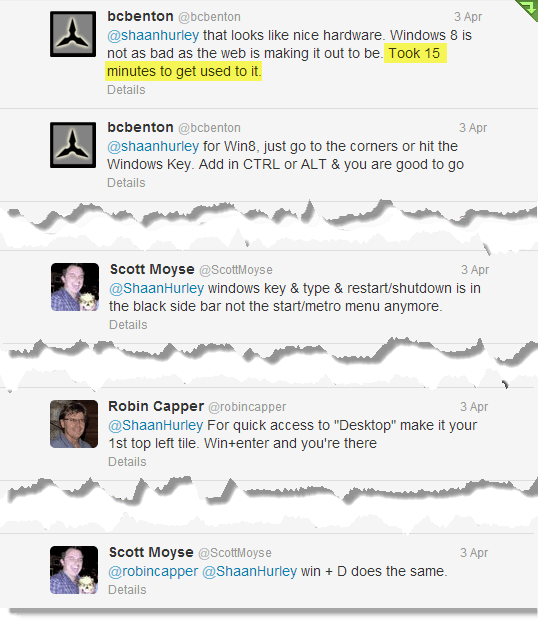 A common comment made about each new release of Windows, is Microsoft keep on burying power user & administration tools. That may be true, especially if you want to browse to them using conventional means. However, once again the indexed search is your friend here, just tap the Windows Key and start typing the name of the tool or setting you are after. Because Microsoft are keen to hide it from users who don’t know what they are doing, you will have to type out the full name since these results aren’t gradually filtered like normal search returns are. Now this is where my pet peeve with Windows 8 comes in, they’ve categorized the search by Apps, Settings & Files. By Default it’s searching for Apps only. You have to use the up & down arrows on your keyboard or click on the appropriate category to see the results you are after. Thank fully this is due to be changed when Windows 8.1 is released in the next few months. You have to actively go and look for the tips and the live tile doesn’t seem to work. However, it does notify you when a new tips is added. I’m certain there are better apps out there, but for now I’m happy with this. The internet media have been giving Windows 8 a pretty hard time, I personally think its unjust and a direct result of those journalists and bloggers not spending a least a week using it for day to day work. If they had of, they would have gotten used to what is a different way of thinking when it comes to using an operating system. Microsoft started the trend with indexed search in Windows Vista, but Vista was a dog. Then with Windows 7 it became a lot more refined and more natural to use. The trouble with both those operating systems is they never encouraged users to step away from the Windows 95, Windows 98 & Windows XP user interface mind set. Over the last few years I’ve been increasingly using the windows key on my keyboard, not only for shortcuts but to find what I want almost instantly. I now minimize clicking through menus as much as possible. E.g I now only use windows explorer if I want to view a collection of files & folders at the same time. If you are decent at typing, this approach is the way forward. In much the same way, using the command line in AutoCAD is still faster and using combo, shortcuts and alias keys in Inventor is faster than using the ribbon (although the gesture based context menus could potentially rival that). It’s all just a case of taking the time to adapt, take a productivity hit in the short term for much improve gains in the long term. If having read this post, all your doubts have ebbed away and now you’re wondering, How do I get Windows 8? Then here’s a link to upgrade, make sure you check out the upgrade offer FAQ in case you’re eligible for a discount. Autodesk Simulation Nastran Launch : Why NASTRAN? Why NEi?